Currently viewing the tag: "affiliation"
Hi everybody! It’s been a little bit since my last statistics post (just about one year, in fact), so it seemed high time for me to do another one of these. Today I’ll be focusing on October 2016 and March 2017, which were our two Affiliation Months this year. For those who are unfamiliar with the term, that’s when the library staff go and ask every person in the library what their program is, so that we can have a general sense of how our space is being used. 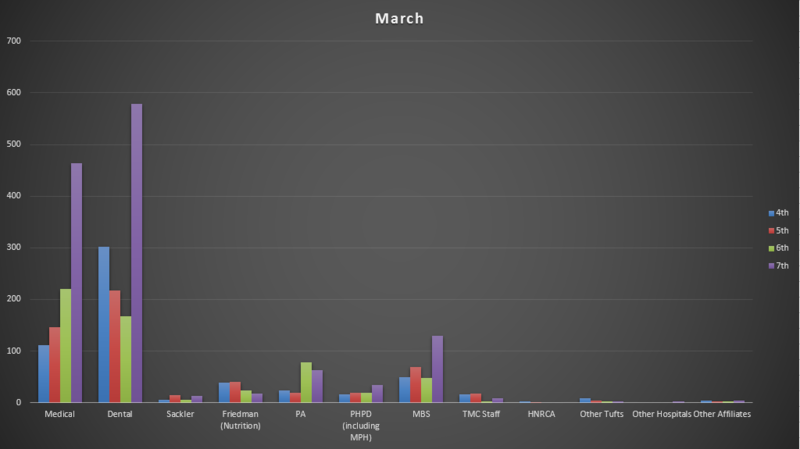 This first chart is comparing the Affiliation Stats from October 2016 and March 2017. To gather this info, we chose 7 days out of each month (one Sunday, one Monday, etc. All were chosen randomly) and on those days went around 4 times a day. 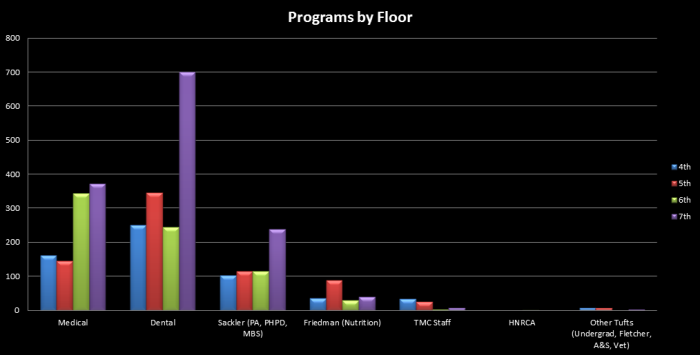 This is always an interesting comparison due to the different programs and the way they operate. Dental and Medical students were gearing up for board and class exams, so it’s no surprise that we would see so many extras in March. There was a jump in PA as well (new class means new exams! ), but then we saw drops with Sackler, Friedman, MBS, and PHPD. So what happened there? It’s hard to say. Different timing on exams, different demands on the classes, all sorts of things can affect attendance in the library. 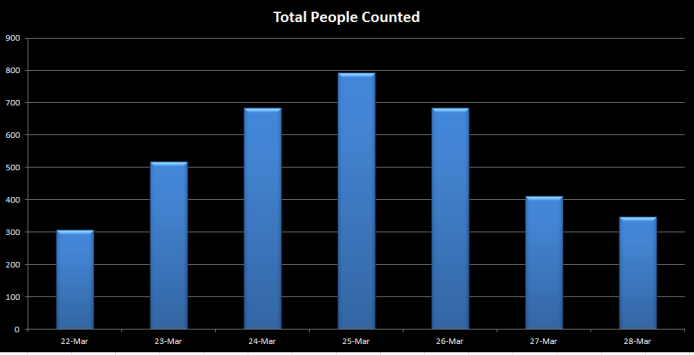 Ultimately, March was still the busier month: we counted 3,327 people in March, but only counted 3,115 people back in October. The thing to keep in mind is that these numbers are only a snapshot. To truly know what the individual program attendance in this library is like for a full month we would need to gather this data every single day for that entire month, and that is unfortunately (or fortunately, depending on how much quiet you like) unrealistic for us. Do you know what is quite realistic, however? 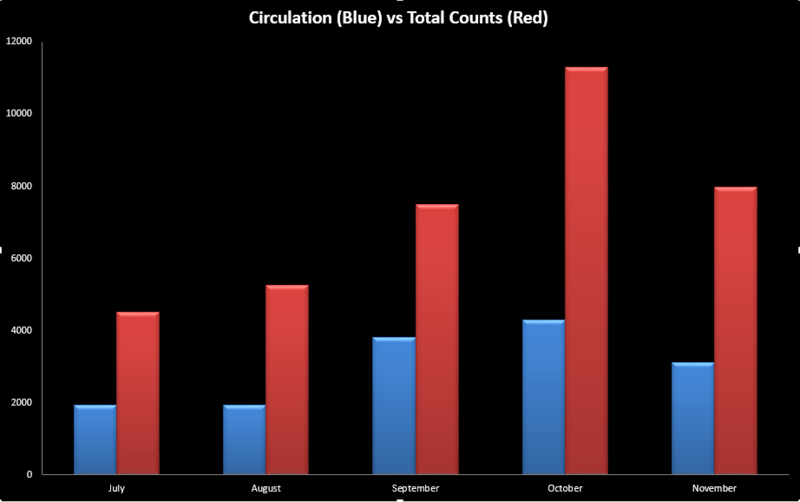 Collecting a month’s worth of circulation data! Bam. That’s a full month of data right there! 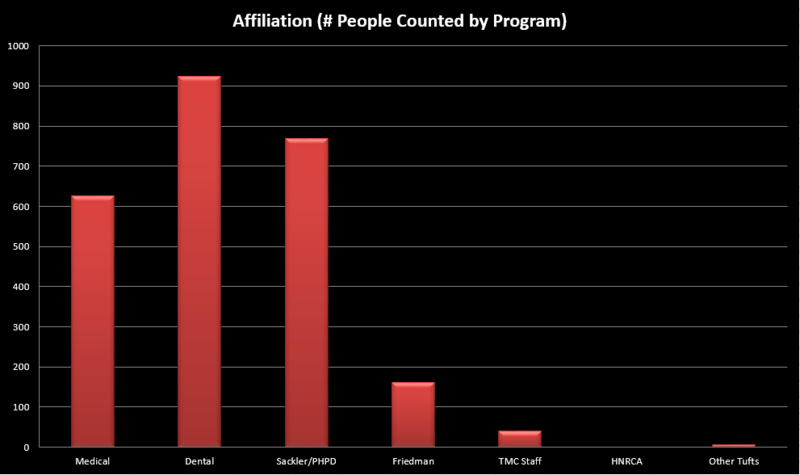 So what does this show us when compared to the Affiliation graph? Well for one, we can see that the space was occupied more than our things were being checked out to a point, which is actually pretty normal. People do like checking things out (skulls! laptops! books! phone chargers! oh my! ), but the library keeps adding more and more space, making it easier to go and hide out and get your studying in. 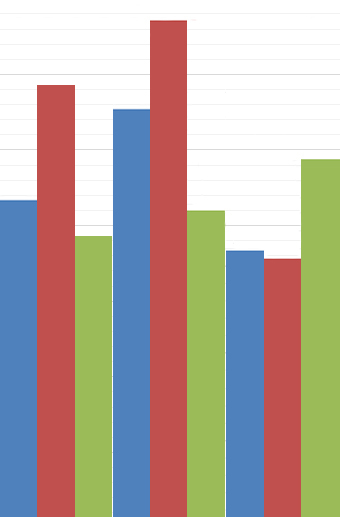 But here are some thoughts: why are the numbers so similar? We never have had a 1-1 relationship between studying and circulation before, but parts of this are surprisingly close. What’s causing the numbers to fluctuate the way they do? Consider: we have exams in March and April, and Extended Hours at the end of March. 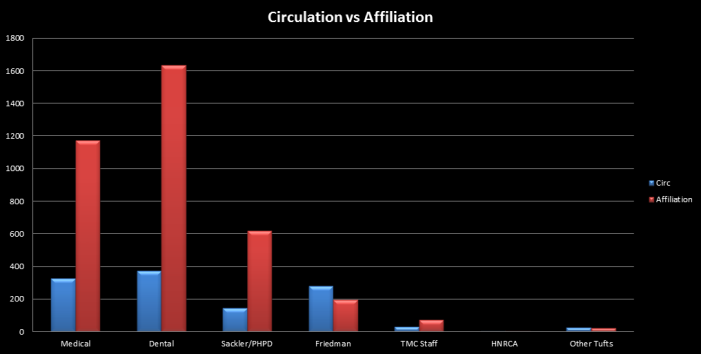 Affiliation was overall higher (by 212 people), but Circulation was lower (by 249 checkouts). Weird, right? There are many factors that affect all of these numbers, but I won’t be going into them in this post. There’s only so much space, and I still need to talk about the floors! So. Dental students love the 7th floor. Surprise! Medical and MBS are also huge fans, so it looks like all of those new study carrels we added last summer really helped! 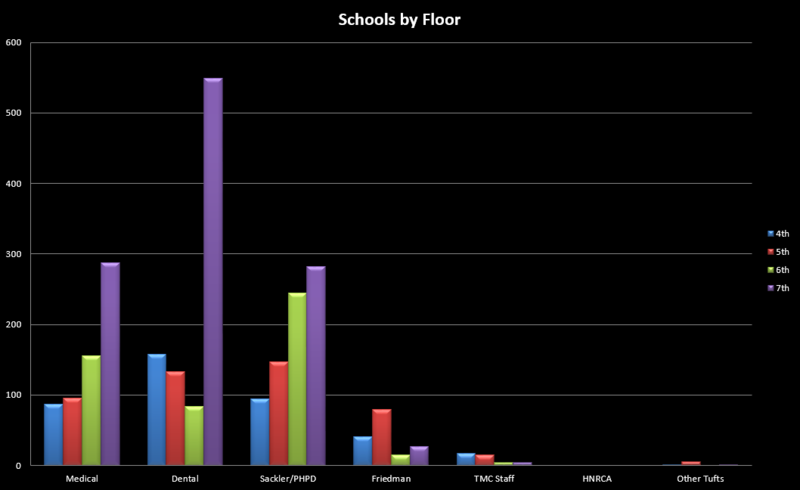 Everybody else is spread rather evenly over the floors, although I do find it interesting that the PA students go up to 7 when they’re not in class (I guess to get away from the classrooms – can’t say I blame anyone). It’s good to see people like the furniture and spaces so much! Warms the heart (which is numbered and on a stand, and you can check out from the Library Service desk for 4 hours at a time. I’m not kidding). 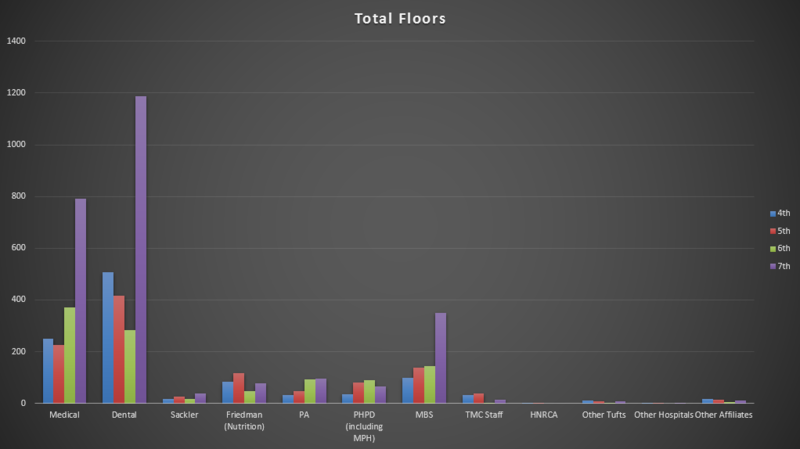 The 7th floor has always been the most popular (generally about twice as popular as any of the other floors), and the breakdown after that is always fascinating. Medical students overwhelmingly prefer the 7th, followed by 6 – study quiet, which makes sense. Since the 4th and 5th floors offer some small group opportunities, those are split evenly. Dental may trend toward groups even more so than I used to think – perhaps that’s why there are so many up on 7, and then in decreasing order from 4, 5, and 6? I would like to state that it is exciting to see Sackler, Friedman, PA, PHPD, and MBS showing up in larger and larger numbers. 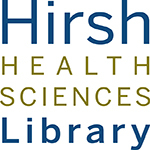 Hirsh Health Sciences Library is for everyone on the campus, and we want you all to feel welcome! That’s why we have so many study carrels, and the Collaboration Rooms, and craft days, and all the other things that make the days go round. And based on the posts from over the last few years, it seems like we’re only getting more and more popular, which is fantastic. Feel free to keep coming in bigger numbers, we have space for you all! And on that uplifting note I will leave you for now. Perhaps I will be able to do a look at the full year’s numbers in a few months, so keep your eyes peeled. Until then: good luck with any exams you have left, and I’ll see you all around the library! Hello hello! It’s about that time again: I’m going to fill your life with statistics and numbers and hopefully a few interesting facts, and you can enjoy it in between panicking about that paper due tonight and that exam you have tomorrow. This post will be a perfect length for you to read and then hit the bathroom before your break time is up and you need to get back to work. “But what about the Affiliation Week?” you may ask. Well I’m glad you asked! The answer is kind of fascinating. So one thing that we strive for with this is to be as accurate as we can with what a “typical” week looks like here. As you can imagine, that is quite difficult, given the propensity of the schools to have full blocks of exams, staggered about the semester. We chose October 25th – 31st this year, since there were no exams that week, and therefore the numbers would be as least skewed as we could make them. Here’s what we saw. 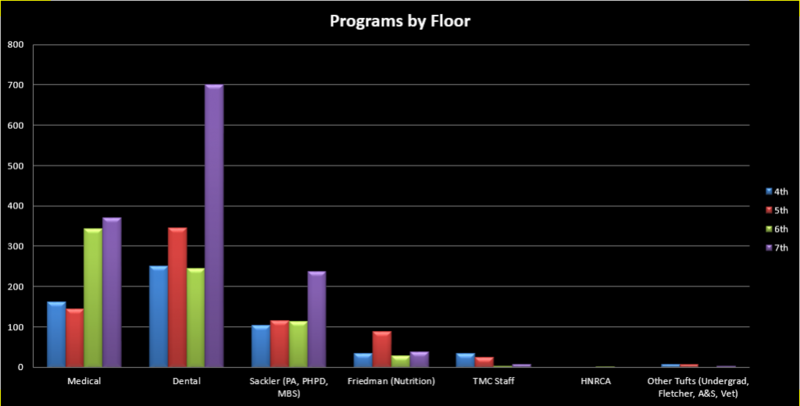 The Dental School dominated the counted programs. This is probably not a surprise to anyone, since that’s been the trend. However, what is a surprise is the combined Sackler/PHPD (which includes PA and MBS). Their numbers have absolutely skyrocketed, and now even outpace the Medical school. That’s crazy! Unfortunately, the way the Affiliation data is collected, we don’t really know how much of that would be MBS students getting ready for MCATs, or PA hanging around and studying after (or in between) classes. But it’s still awesome to see! If you break it down by floor, you’ll notice everybody loves the 7th floor, because of course they do! It’s great! Tons of individual study space, and plenty of group rooms. Dental looks like if they couldn’t take the 7th, they’d stay on the 4th, but everybody else started on the 7th and then trickled downward. Well…except for Friedman. Nutrition students like the 5th floor, it looks like – possibly big fans of the collaboration rooms? Incidentally, this past November I actually went to a library conference down in Atlanta. I don’t know if you’ve been to Atlanta, but if you go, make sure to have some local beers (many good microbreweries down there), and go check out the Georgia Aquarium! The whale sharks are insane. Sorry, got carried away there. 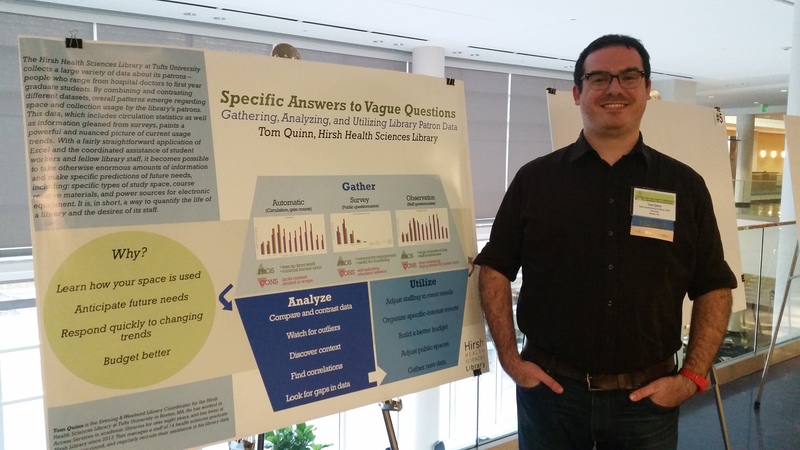 The reason I mention this is that all of my work with stats here at Hirsh over the years led me to presenting a poster down at the conference! I talked with people from around the country about data collection and its uses. 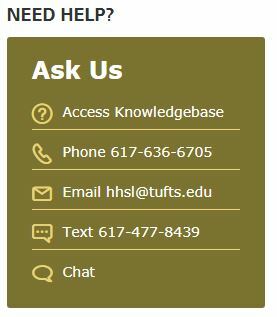 As it turns out, your very own Hirsh Health Sciences Library is at something of a leading edge with all of this! See, the entire philosophy behind finding all these numbers out is that we want to be able to serve all of you as best as we possibly can, and every piece of information helps with that mission. I don’t tend to get too technical with these posts, but we do know (for instance) that laptops, Mac chargers, and phone chargers are the most popular items to be checked out. Books have been slipping every year as the schools push toward digitization, and the library has to be able to stay on top of that. Well, we’re not alone! Other libraries – all libraries, really – are trying to keep up with the changing face of their patron body, and they aren’t always getting the info they need from their patrons or schools before they actually need it. So they’re starting to turn to data collection – Circulation statistics, head counts, all that stuff – in an attempt to see trends as they’re starting. I was very popular at this conference, as it turned out. That is me, looking a combination of tired and excited, standing next to my poster (which, I’d like to note, was visually designed by the delightful Katherine Morley, Admin Coordinator for Hirsh, and head of our PR committee – so the brains behind events like our monthly crafts). The graphs on there are actual data from the library – specifically, it’s Circulation, Roaming, and Affiliation data from July 2013 through October 2015. Two and a half years of numbers, and trends, and watching our library grow and expand. I won’t lie – I was feeling pretty proud of what we do here while I was talking to people. In the nerdiest way possible, of course. On that note, I will leave you be. Thank you for sticking with me on this post! I truly appreciate it. Now, go hit the bathroom, get yourself some caffeine delivery system of choice, and get back to studying! I have faith that you’ll do well, but fortune favors the prepared. Good luck with the exams, and have a good break! Hello all! 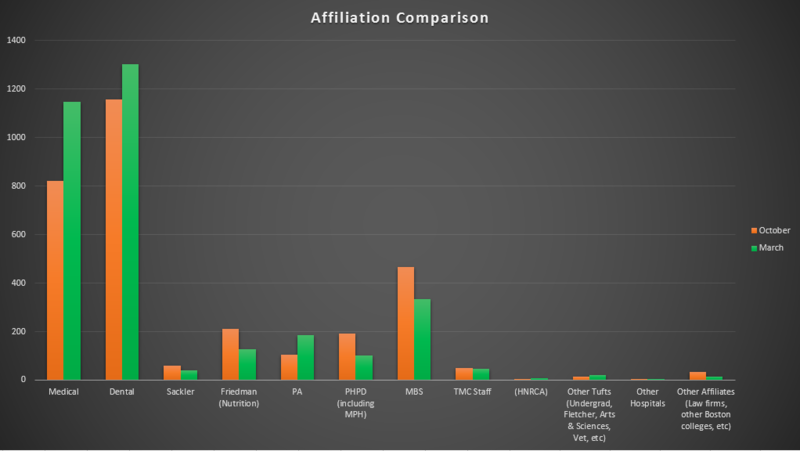 As you may recall, the Hirsh Library ran its biannual Affiliation Week survey back in March, which means the time has come for a blog post where I show you some of the numbers, so you can see how your school sized up against the others! So, ah…congrats, Dental! You blew everyone away in sheer numbers of people studying in the library. 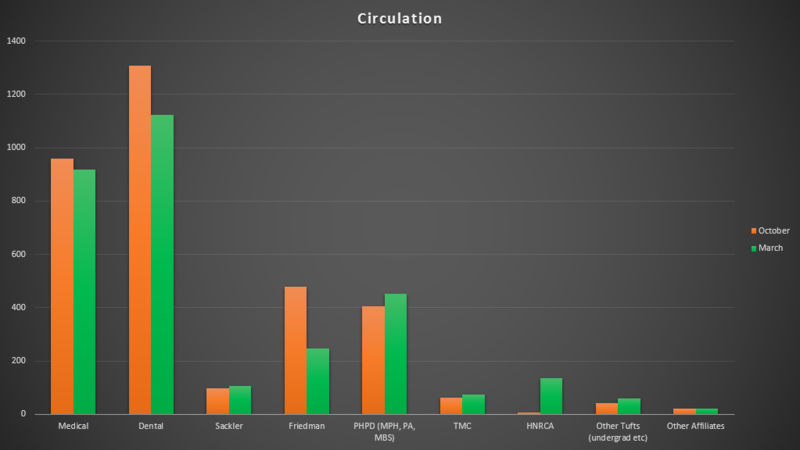 The circulation race was a bit closer, though: Dental was first with 372 checkouts, but Medical was a close second with 327, and Nutrition actually came in at third with 281. Of course, this is a good time to point out that it is not actually a contest between the programs – Hirsh is here to help everyone on our Health Sciences campus, whether they show up in huge numbers in these data sets, or whether we only see a few of their members all month. It is very helpful to know how we’re getting used, though, so here we are. What’s really interesting here is the way it got used, though. Yes, Dental used the heck out of the 7th floor, but once you remove that outlier what you see is…remarkably homogenous. Medical broke almost even between quiet floors on one side and “noisy” floors on the other. If they weren’t on the 7th floor, the Dental students could be almost anywhere else. Sackler students (which, for this survey, includes PA, PHPD, and MBS) were again preferring the 7th, but appeared willing to show up almost anywhere with equal interest. Nutrition preferred the 5th floor, though. Perhaps due to the sheer amount of group-appropriate space on that floor? Thank you for reading! Once all the numbers for this academic year are in this summer, I will be putting together a look back at this past year, which has been busier than we’ve ever been (and perhaps even busier than we were expecting to be). In the meantime, if you’d like a more in-depth discussion of any of the information presented (or if you’re just interested in chatting usage or data in general), feel free to come see me at the Service Desk on Sackler 4 some weeknight! I’m always happy to talk. Especially after being driven half-blind by Excel’s chart system.